3D printing has gained momentum since the late 1970’s, and it’s now pushing the envelope technically and entering the mainstream commercially. Although to most the public, this technology is still in an “underground” phase, but that’s changing quickly as mainstream media is reporting on developments now. Here are a few places, industries, and websites that I expect to see transitioning to 3D printing in the near future. 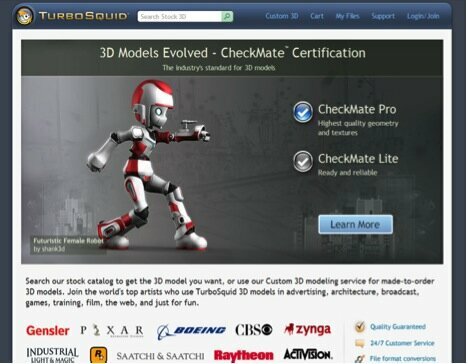 Quite a few websites exist online to offer both free and paid 3D models, and Turbosquid is one of the more prominent one to keep an eye on. Having the ability to simply grab a model online, from a growing number of collections, is a significant catalyst for the expansion of 3D printing. Countless hours are thrown into creating respectable designs – what if 3D printer enthusiasts could simply click “download” on these Turbosquid models and then print? I’m curious to see if Turbosquid catches on to the “maker movement” and plays along. Regardless if Turbosquid does or doesn’t’ do anything, some models already offer .OBJ format for download. Maybe there will be more emphasis on models for additive manufacturing, or small adjustments such as a “print” button in the near future. Thingiverse is similar to Turbosquid, but there are two things that make it quite a bit different. First – it is much smaller than Turbosquid. Second – it is entirely dedicated to models you can 3D print through a home printer. Although quite a few “maker” enthusiasts have checked out the website, I still feel like it needs more coverage. 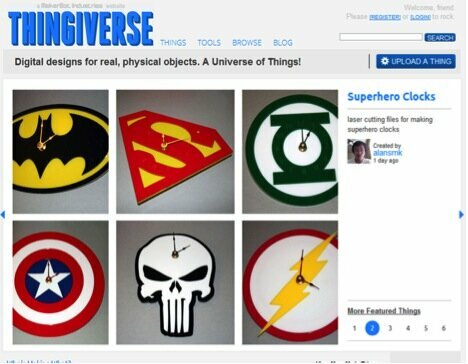 Thingiverse deserves more credit as it is entirely free, open source, makes adding photos easy, and utilizes the Creative Commons licenses. I’m willing to bet that the traffic analytics to this website are going to blow up. TED is a website and organization that is dedicated to spreading technology news. A large variety of subjects have been covered in TED presentations and then shared in video on this website, including: science, business, global issues, and technology. 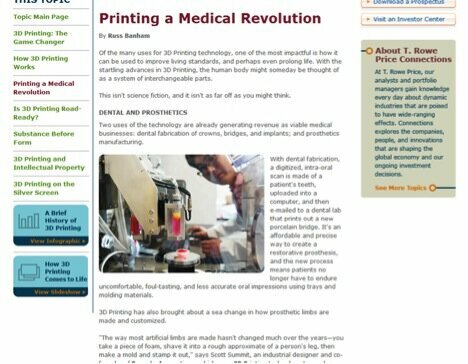 3D printing has been covered a few times, particularly in the medical world. This renowned website is significant, as it promotes “ideas worth spreading” to a worldwide audience–and we’re glad to see that 3D printing is one of those ideas. 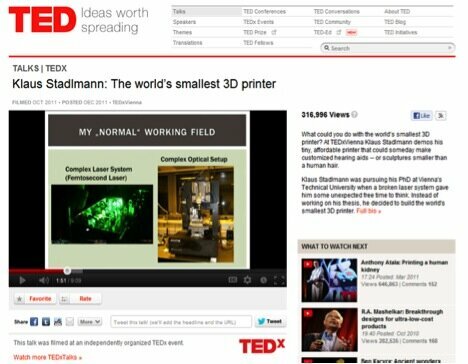 I’m willing to bet that 3D printing is going to show up in a few more events on Ted in the near future. 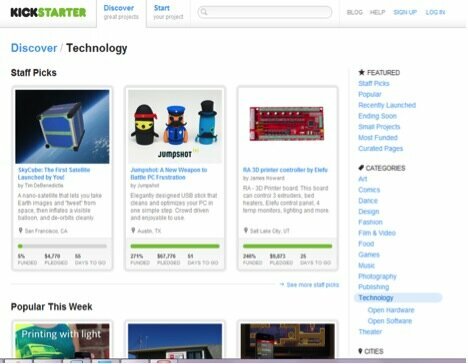 Kickstarter is a website that revolves around community funding of various projects, a process called crowdfunding. Project managers offer various incentives for everyday users to donate to and fund the project, whether it is for a copy of the finished project, a special edition piece, an autograph, or whatever else the presenter decides to offer. All of the donated money is pooled together, and sent to the project manager. Various projects include political campaigns, disaster relief, and technology. Quite a few personal 3D printers have been crowd-funded by Kickstarter, and it’s exciting to watch what comes up next. The next big thing might be another resin printer, FDM printer, printer part, portable printer, or even prints themselves–-3D printing can only benefit from websites like Kickstarter, and we’ll surely see more of Kickstarter in the maker movement. Quite a few entrepreneurs are taking advantage of 3D printing‘s ability to create 100% custom products. 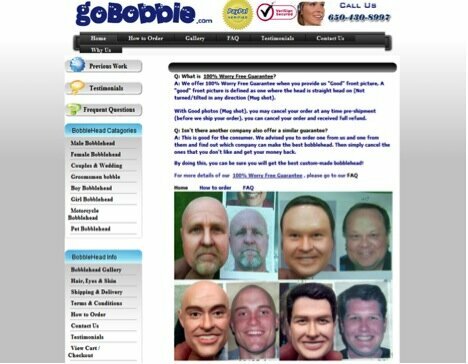 My personal favorite application would have to be custom bobbleheads, but there are several other companies like this. Some offer custom robots, some custom action figures, and others things like custom dolls. The phrase “custom 3D printing” is now a part of our lexicon thanks to these new businesses. In our capitalist society, where any idea can take root, we can expect all sorts of businesses to continue to sprout up around this technology. Some will succeed, some will fail – but certainly we’ll see some very cool new ideas come to life through 3D printing. 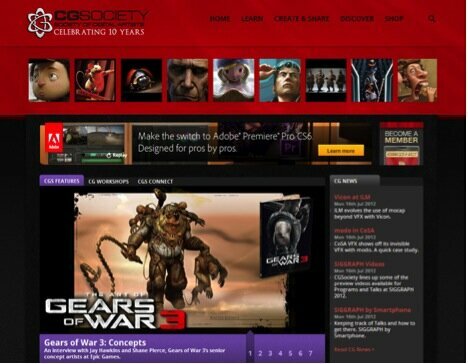 3D artists are one of the key catalysts fueling the maker movement, and where will you find them? In 3D discussion forums, of course. As 3D printing begins to finally catch on at a much more universal level, more and more 3D artists are printing physical copies of their models, and they’re sharing their work. 3D printing is a natural progression for 3D artists so as they see other printing, they are going to want to get into 3D printing as well. There isn’t a doubt in my mind that 3D printing will become much more prominent in the medical world. The medical applications in which breakthroughs are occurring right now are significant; what about 10 years from now? Visionaries like Anthony Atala are already 3D printing bladders, parts of kidneys, and skin. A biomedical team in Belgium already used 3D printing to assist in facial reconstruction. In another instance, a titanium jaw was manufactured for an elderly woman through this technology. If these kinds of things are currently happening already, what’s going to be happening in 2030? Keep an eye out on medical journals; you’ll be seeing more and more 3D printing headlines in the next few years, or even months. 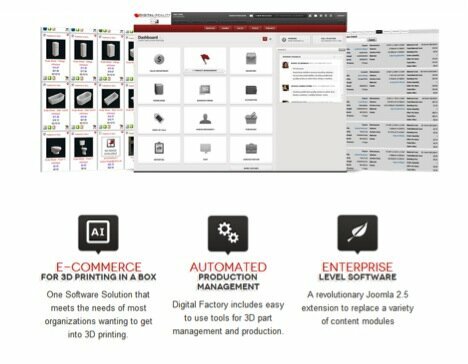 Quite a few 3D printing companies are using software to bring personalization to customers. These various types of software found in the 3D printing world make customization very easy for consumers. Typically, these tools only require a browser, a mouse – and no 3D experience. Some software involves writing text or dropping images on prints, while other software allows for the creation of new models seemingly from scratch. As 3D printing continues to catch on, 3D development will too, but in the meantime, easy-to-use software will start to rocket in popularity. As 3D scanning quickly becomes more efficient, 3D printing enthusiasts are going to have an easier time getting designs. Some people are already scanning things like archeological artifacts, artwork, mechanical pieces, and body parts. 3D models are valuable in the arena of additive manufacturing, and scanning helps to bring more models into the action. There is already an app for scanning things (even if not very efficient), but what’s going to come in the next 5 years? Will it soon enough be as easy to scan and print a 3D object as it is a sheet of paper now? It’s good to see that the government is already starting to catch on to 3D printing; perhaps they will continue investigating this manufacturing technology. Having the ability to create 100% custom parts is a big deal. Being able to create those parts out of a wide variety of materials is extremely valuable. 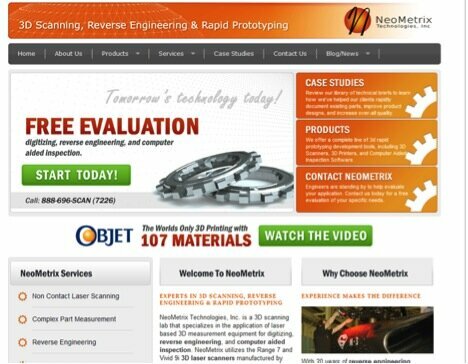 Being able to create designs which machining can’t compete with – that’s really something. Don’t forget the speed of 3D printing. I’m sure the aerospace industry, the military and various government research projects would benefit from it, wouldn’t you say? 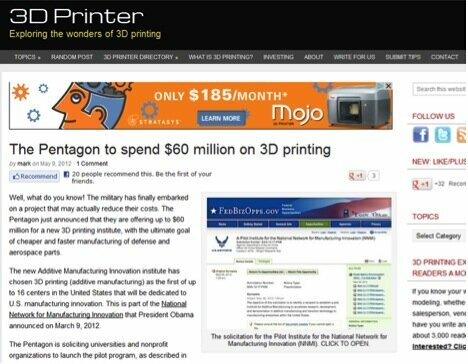 Without a doubt, 3D printing’s popularity is gaining momentum. The technology is accelerating in power and efficiency rapidly, and you are seeing it covered now in almost every facet of the media. The word is getting out and getting out quickly. In just the last few years, and in particular this year, media coverage has exploded, and it’s exploded because the 3D printing itself industry has exploded. Yet it’s still only the beginning, so expect to see 3D printing and its benefit to the world being covered over the next few years not just where I’ve mentioned in this article, but virtually everywhere.